activism and the right-wing agenda. I grew up on the other end of the conservative Christian perspective where politics never entered the church and the general idea was the theology would inform ideology so let’s just stick to theology. 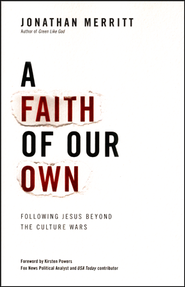 Merritt wrote A Faith of Our Own largely in response to the culture warring church. He calls for a third way for the church to engage culture – not as warring, not as separatist or passive, but as culture influencers. Despite coming from a distinctly different place, I resonated with this book. I felt pulled toward actions and engagements I might have otherwise not considered. Not to say I do not also resonate with Merritt’s critique of the culture warriors. Having been in conservative Evangelicalism my whole life I have seen much of the “us and them” mentality culture warring creates, and it has always chafed. Too many Christians are caught in the mindset of believing we can vote morality into office and that will change culture. As Merritt points out, culture doesn’t change that way. It influences politics, not vice versa. I found A Faith of Our Own to be just the kind of thoughtful engagement with the conservative church’s traditions and mindsets that is needed. It isn’t shy. It is pointed but not aggressive or antagonistic. And over all it takes the reader in a positive direction instead of settling for critique and criticism. Merritt proposes a better way and opens the door for further conversation and action. For any who are trying to sort through how to engage culture, politics, and the church all at the same time I highly recommend this book.